Building a Raspberry Pi media center or retro gaming console can be difficult if you don’t know what you’re doing. You need to find the right parts, and often you can end up spending more than $100 for a project that should’ve been relatively cheap. That’s why starter kits are a great starting point for new Raspberry Pi builders. Starter kits tend to be inexpensive, and they can be a good way to source all of the parts that you need without too much work. 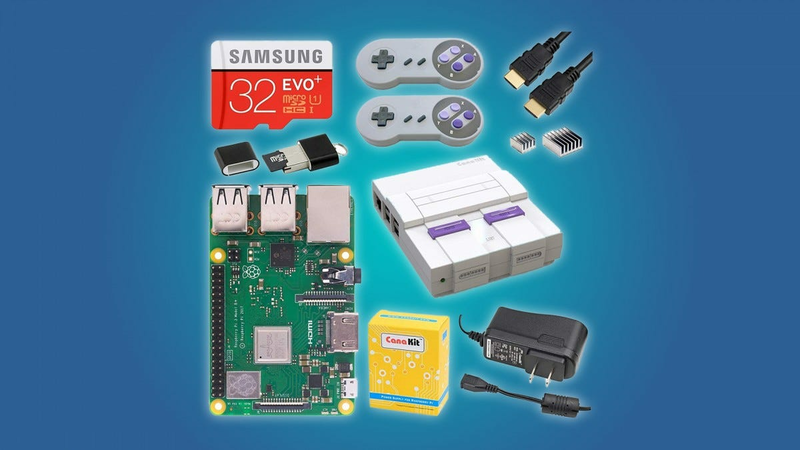 Right now, Woot is selling a Raspberry Pi 3 B+ Ultimate Starter Kit and a Super Retro Gaming Kit for $70 each. That’s $20 off of an already inexpensive kit. Both kits come with a Raspberry Pi 3 B+, a power supply, heat sinks, a 32GB Samsung SD card, an HDMI cable, and building instructions. The Ultimate Starter Kit is geared toward novice programmers or people who want to build a tiny media center for their TV. It’s packaged with a clear case, jumper wires, LEDs, ribbon cables, an ethernet port, and a dual-band 2.4GHz and 5GHz wireless LAN connector. Not to mention, it comes preloaded with NOOBS, an easy OS installer, so you can hit the ground running. The Super Retro Gaming Kit is, obviously, targeted toward retro gamers. While it doesn’t come preloaded with any games, it does come with two SNES style gamepads, a SNES style case with a built-in fan, a RetroPie download wizard, a Bluetooth connector, and a Wi-Fi connector.